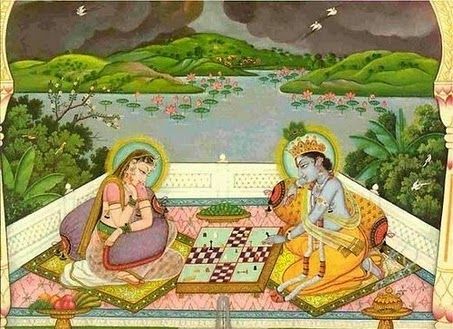 Review of literature suggests that the games of chess has had many variations and one of them is the very famous game of dice played by Yudishtira and Duryodhana, also know as ‘pagade‘, which has been very well described in the epic Mahabharath. This game can be played by 2,3 or 4 players. The roll of the dice predicts a players moves. This is a 8 squares games, constructed on a piece of cloth. The player has to move all around the squares, avoiding being taken down and at the same time trying to win over other players, by reaching the center of the cloth. Each player has 4 pawns to play with, and it’s the players responsibility to bring all the pawns to the center of the cloth. This game came to be known as ‘Pachisi‘, which was played by the Mughal emperors during the 6th century AD, and evidence has been found in the Ajantha caves. The variations of ‘Pachisi‘ are the modern games Ludo (coined by the British) and Aggravation (a US version of ludo). Literature review also points out that down south, there were even more variations of the game Pachisi. Around 10th century AD, the Tamil variations came to be known as ‘Adu Puliattam‘. Also known as ‘goats and tigers’, involving 3 tigers and 15 goats. It’s a 2 player games, where the player owning tiger will try encountering the goats, and the goats have to be moved strategically to avoid the tiger. It a tiger catches a lone goat, then the players loses a goat pawn, and if 4 goats surround a tiger, a tiger pawn is lost. ‘Nakshatraattam’ (Star game) is the one where each player cuts out the other and the game named ‘Dayakattam’ with four, eight or ten squares, is similar to modern day Ludo. Note that most of the pictures and sources are from veda.wikidot.com, wikipedia and Aphilomath Journal.